Bill by Linda Smith, a member of EDHAA. Our region is a great place to live. We are perfectly situated between the Sierra and the Pacific, within just an hour or so drive from skiing or surfing. Although we can reach these breathtaking sights easily, there are so many reasons to stay right here, including our vibrant arts scene. American author Thomas Merton said, “Art enables us to find ourselves and lose ourselves at the same time.” We found 10 groups, from Placerville to Roseville to Lincoln, that selflessly promote all types of art in our region. These associations are dedicated to bringing the work of artists – working and creating right in our neighborhoods – into the public’s eyes and hearts. Find a show, lose yourself and go! Swing Shift by Kit Night, a member of EDHAA and EDAC. For nearly 30 years, the Arts Council of Placer County (PlacerArts) has been channeling the arts here in Placer County. This nonprofit promotes all types of art forms, from theatrical to visual. They work to create and maintain a welcoming environment for artists and art organizations and to increase the awareness of such arts and programs. Because the majority of their events are free, this membership-supported organization depends on the 100 volunteers to make all things art happen in the county. “Our mission is to be a catalyst for arts and humanities,” explains Angela Tahti, executive director for PlacerArts. 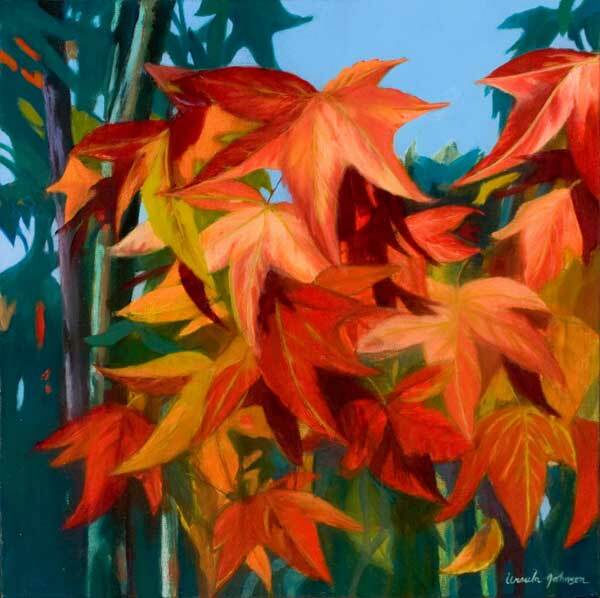 Don’t miss the 18th Annual Autumn Art Studios Tour! The mid-November self-guided tour spans over three days and showcases artists in their own studios. It is a picturesque wonderful drive to see great art, from silks to ceramics. 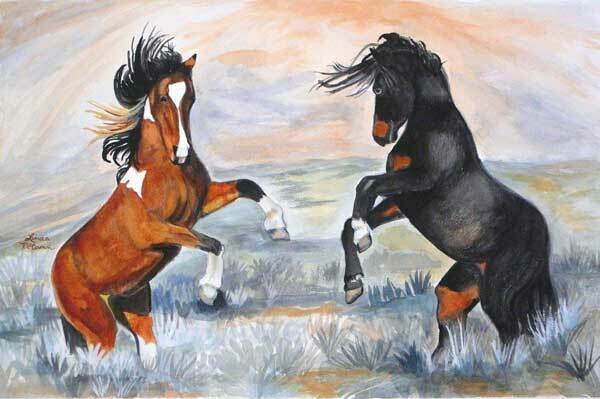 Winter Dance by Linda McCann, a member of EDHAA, EDAC and PAA. President Judy Arrigotti helped establish the not-for-profit El Dorado Hills Arts Association (EDHAA) about five years ago. “Art has always been my passion,” Arrigotti admits. She works hard to support and encourage arts and artists within her community. The group, with nearly 100 members, has monthly meetings where the association sponsors educational opportunities with art demonstrations of all kinds. Two- and three-dimensional artists share their expertise, from jewelry making and ceramics to painting and drawing. EDHAA has two big events each year. The self-guided Studio Tour, where more than 50 artists open their studios up to the public and offer demonstrations and art for sale, happens in May. The group also hosts a Membership Show where you can check out the excellent talent in one location; spring and summer dates and locations are pending. Auburn Ambars by Ursula Johnson, a member of RosevilleArts!. The El Dorado Arts Council (EDAC), with its nearly 700 members, is an umbrella organization that helps organize and promote the arts, artists and art associations in El Dorado County. Although it has been in existence for nearly 27 years, in the last five years there has been a major resurgence and renewed energy for EDAC. “We are an incubator for art and artists in the county,” Executive Director Deb Jensen says. “We make sure there are artful things going on all the time.” The group helps local associations organize and matches them up with appropriate patrons and sponsors. One big event in their expanded repertoire is the Holiday Arts Market on Thanksgiving weekend, held in their ArtSpace Gallery on Main Street in Placerville. It is a great place to see local art of all kinds and purchase one-of-a-kind holiday gifts. 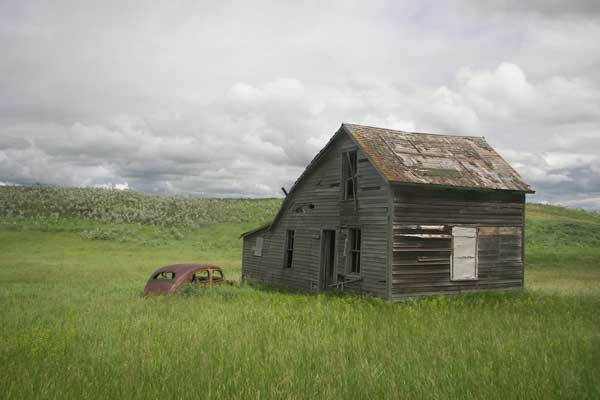 Abandoned photography by Gayle Roger Streff, a member of Roseville Arts!. A patron is a champion of a cause, and to Folsom Patrons of the Arts there is no better cause than the arts and artists of the Folsom area. This nonprofit’s mission is to sustain an environment where the arts can grow and flourish. Along with many great works, they maintain an events calendar and sponsor several ongoing art shows in town. “Our job is to highlight others,” says President Caryn Rizell. The group’s focus is to get their arms around everything arts and culture in Folsom and make the information available to everyone. They are most proud of being able to assist young artists through scholarships that help them continue their art education after high school. In 2010, three lucky Folsom-area students received $1,000 each to partially defer higher education costs. “We are always looking for additional funding to help fund more scholarships,” Rizell says. 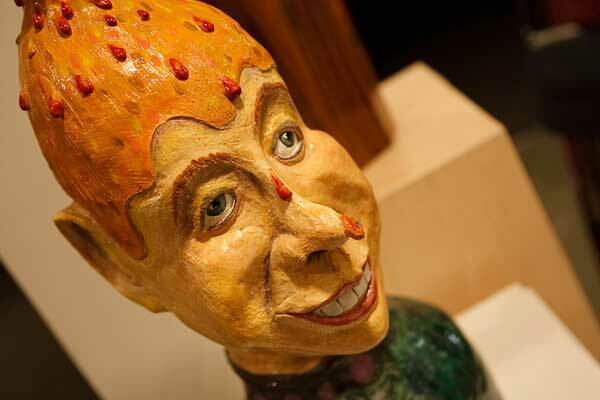 Sculpture by Marsha Elam, and displayed at a past “Lottery for the Arts” exhibit. Watercolorist and member of Folsom Arts Association’s Board of Directors Barbara Otey joined this nonprofit in 2007. She was interested in finding a local group that shared her interest in promoting the arts. At the time, there were only 15 members, and she helped grow the group to more than 120. “We are a group of like-minded people,” Otey explains. “We support our interests with monthly art demonstration workshops.” The group is dedicated to cultivating and supporting art appreciation throughout Folsom and beyond. The public can view members’ works at the Procissi‘s Wine and Art Gallery on Sutter Street. However, their biggest event, the Members Show, is at the end of spring. In 2011, it was held at Three Stages at Folsom Lake College; 43 artists, ranging from oils to metal sculpture, enjoyed a month-long show. 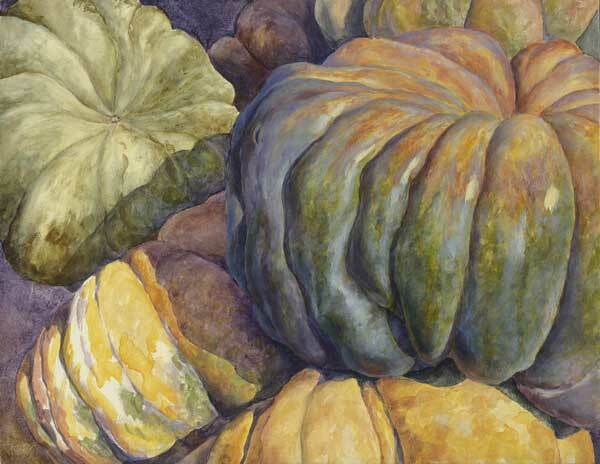 Pile of Pumpkins by Sheri Hoeger, a member of EDHAA, PAA and FAA. This nonprofit, founded in 1986 to support and promote the arts, culture and history in the greater Lincoln area, currently has nearly 300 members. Funded almost entirely through donations from the community and its members, Lincoln Arts sponsors numerous events and activities throughout the year – all of which the public can take advantage of. On September 17, Mick Martin and the Blues Rockers are playing in their free Summer Concert Series at Beermann Plaza; proceeds from the delicious barbecue go towards supporting Lincoln Arts. Their biggest event, Feats of Clay, is a month-long nationally recognized ceramics competition and exhibition, held each year in the historic Gladding, McBean factory. Among the miles of ceramic pipe and one-of-a-kind architectural adornments in this working factory, scores of visitors and pottery enthusiasts get a chance to view some of the finest ceramic art in the world. “In 2012 we will celebrate the 25th anniversary of Feats,” says Executive Director Claudia Renati. Marble Valley Regional Center for the Arts (MVRCA) has the land, – two thousand plus acres south of Highway 50 off Bass Lake Road – but now they need the funding. The all-volunteer nonprofit is working hard to make their dreams of building a spectacular showcase for all types of art in the Sierra Foothills come true. “We want to give this cultural gift to our community,” says President Normadene Carpenter. The 33rd Annual Butterfly Concert will be held Sunday, September 18 to benefit MVRCA. It is the only outdoor symphony concert in our region. The concert is not named for brightly winded Lepidoptera; rather, its moniker came about because in the 33-year history it flitted around the area and had no place to call its own. Placerville Arts Association (PAA) is the oldest continuous operating art group in El Dorado County. This non-profit all-volunteer group has nearly 200 members – artists of all kinds who appreciate art of all kinds. Their mission is to promote visual arts in the area by coordinating art shows, demonstrations, workshops and field trips. They also reach out to graduating high school seniors who are working towards a career in the arts. President Lucia Rothgeb loves being part of PAA and the local art community. “They are just fun people,” she says. PAA sponsors the bi-annual (spring and fall) Studio Tour where approximately 62 different artists show their work at 16 locations around El Dorado County. This year’s fall event will be held September 24-25 and October 1-2. “It’s amazing the artistic talent you find in the Rocklin area,” says Gini Crepps, president of Rocklin Fine Arts (RFA). At RFA, art matters to the more than 50 members and sponsors. Their monthly meetings bring speakers and educators in to help the members learn more about their craft. The newly organized group was established in 2007, as RFA was working to enhance the City of Rocklin via an organized group of artists that encourage the participation of area businesses, schools and artists. The City supports the group by providing the historic Finnish Temperance Hall for their annual Membership Show. On the last weekend of April, a wide variety of mixed media Rocklin-based artists are able to show their work and also offer it for sale in the Artist’s Marketplace; members’ work can be seen year-round at Rocklin Florist and JD’s Deli. This non-profit Roseville-based group boasts a healthy membership of 500 with nearly 100 volunteers. “People are so generous with their time, talent and treasures,” Julie Hirota, CEO of the gallery says. The gallery, which opened in 2008, offers a wide variety of artists’ work and lots of classes and events. “Art is imperative in all stages of life,” Hirota explains.